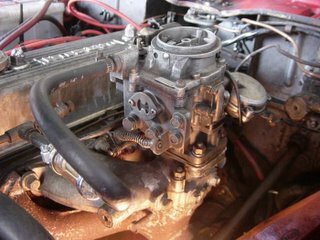 Here's some pictures of the engine, carb, and valves. As you can see, the carburetor has already been converted from a Toyota engine (possibly from a 3K)...found the original twin SU carbs, but the shop is selling it for P8k! (and the seller is still not sure if it's working!) 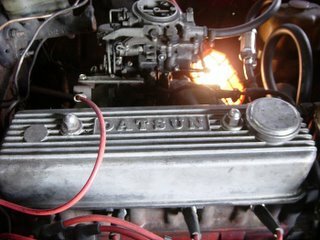 So I'll stick with this carb for the mean time and so far the engine seems to be comfortable running with this conversion. 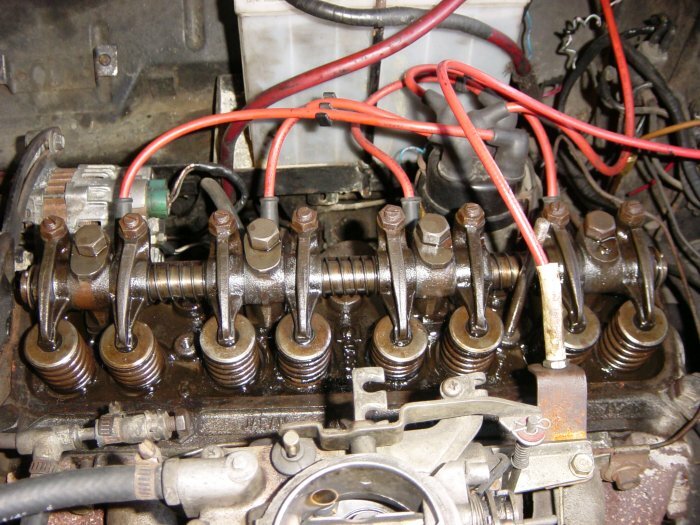 The valves and rocker arms look ok to me. I was expecting gunk and hardened oil on the valves, springs, etc. Although I'll have to flush the engine with 5W-30 or 10W-40 oil just to be sure on the next oil change. 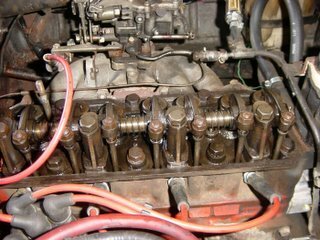 Also had the leak in the exhaust welded up and had the new gasket applied with silicon Hi-Temp gasket maker to seal the header pipe. The welder added a one inch extension on the exhaust manifold down pipe to keep it from being stressed too much...he also welded the support bracket on the pipe, since it wasn't welded anymore. The engine now purrs like a cat and the exhaust note sounds balanced..."quietly loud" but not noisy. I hope the asbestos exhaust pipe gasket holds...this is my second one in less than a month! 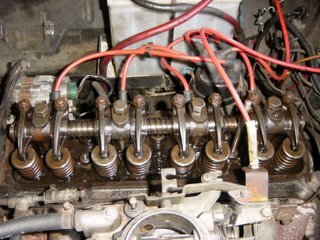 Replaced the contact point and condenser (Bosch parts, but made in Japan - weird...the box seems older than me hehe), since the mechanic couldn't get the timing right...carb backfires even at high rpm - 4000-5000. After adjusting the carburetor and timing, the engine runs much smoother, but the mechanic still couldn't get rid of the low rpm backfires...most likely the converted carb is the culprit. Well, I can live with it. As long as it's reliable - I've heard that the twin SU's are a pain to synchronize. I also had the carburetor sprayed with carb cleaner (Whiz) to clean out the gunk and carbon deposits especially since I'm running the engine without an air filter (need to find a way to install an air filter without it hitting the hood! ).